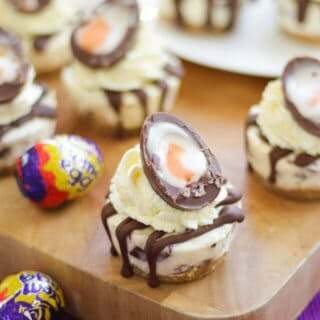 No Bake Mini Creme Egg Cheesecake Recipe - delicious light and creamy no bake Easter dessert. The perfect cake for your Easter celebration! Pop into the freezer for an hour or the fridge for 3 hours. Remove, run a knife around the outside and careful pop out onto a plate. Put back into the fridge (or freezer if you have the space). Meanwhile, melt the milk chocolate carefully in a bowl over a pan of simmering water. Allow to cool for 10 minutes. In another bowl beat the cream for decoration until stiff. Pop into a piping bag with a large star nozzle in the end. Pop the melted chocolate into piping bag, remove the cheesecakes from the fridge or freezer and drizzle over. Pipe swirls of cream on top and top with half a Creme Egg.